14ymedio, Marcelo Hernandez, Havana, 7 April 2017 – A shout disturbed the morning’s tranquility. “Avocaaaaaaado!” shouted the roving salesman as he toured the streets of Central Havana. Considered the “green gold” of foods, this fruit could become an important source of income for the island, due to the high level of consumption around the world. With the diplomatic thaw between Havana and Washington, some local farmers are hoping to export the fruit to the United States. In 2015, Americans consumed about 907,000 tonnes (metric tons) of avocadoes, twice as much as the year before. And the phenomenon is not limited to the United States. 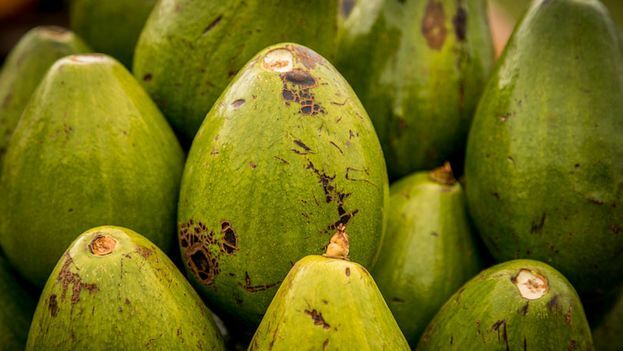 At the international level the fruit is gaining ground; in 2013, 4.7 million tonnes of avocadoes were harvested, according to the United Nations Food and Agriculture Organization (FAO), more than twice as much as two decades earlier. Mexico leads the market with 80% of world production, and in the Caribbean our neighbor the Dominican Republic harvests about 290,000 tonnes a year. Last December, scientists from the University of Cordoba (Spain) revealed the very high caloric value of the fruit’s pit, saying that it has “optimal qualities as a source of thermal energy comparable to other currently marketed biofuels.” The pit contains an average calorific value of 19,145 megajoules per kilogram. In Cuba, the fruit is destined for domestic and tourist consumption, but there is no industry for processing or extraction of the oil, much appreciated in gastronomy and cosmetics. The authorities are currently seeking investors to open a pilot plant for these purposes, industry sources told 14ymedio. In Cuba, the Antillean avocado variety is crossbred with its Guatemalan relative and although the result is large fruit with consistent mass, specialists say that it has low oil content compared to other varieties. Private farmers distribute their crops among the markets that operate based on supply and demand and the individually-operated businesses that have flourished in the country in recent years. In this network the value of the product has experienced an upward trend in recent years. The increase in tourism has influenced the shortages of some foods, and increased their prices, including avocados. “It’s in high demand and when it’s in season it is one of the most requested dishes, especially by foreigners,” José Miguel, a waiter in a private restaurant in Santiago de las Vegas, commented to this newspaper. The state markets sell avocados by the pound, at a price that does not exceed 5 Cuban pesos (CUP), but as a rule they are small and unripe. “If you go out in the morning looking for one to eat at lunch time, you have to buy it from a pushcart vender or from a supply and demand market,” José Miguel emphasizes. The climate has also contributed to the rise in prices. Last year was not a good year for avocado production on the island. Last September, the agronomist Emilio Farrés Armenteros, director of the Fruit Trees Division of the Agricola Business Group, told the official press that the climatic conditions were damaging the harvest. With the country experiencing the most intense drought of the last half century, the rains did not arrive in time for the flowering of the trees. A situation exacerbated by the exhaustion of the nutrients in the soil due to the abundant production of 2015, which reached 120,000 tonnes. At the end of 2016, the avocado harvest totaled a much lower 90,000 tonnes. However, the thaw with the United States is not enough to get Cuban avocados on American tables. In the middle of last year Barack Obama relaxed the regulations for the island’s coffee growers who sold their product to the US, and the official response from Cuba was not long in coming. A declaration signed by farm leaders in Santiago de Cuba joined the top management of the National Association of Small Farmers (ANAP), controlled by officialdom, in rejecting the measures implemented by the White House. Since then, no local producer has sold a single coffee bean to potential US customers. Nevertheless, and although exporting is still an illusion, having an avocado tree guarantees the economic sustenance of many families on the island. Land with an orchard of fertile trees shoots up in price on the classified ad sites, almost like those that contain a well or a house with ceiling tiles. Some owners of avocado trees have chosen to sell a full year’s crop. “I have an arrangement with a neighbor who paid me 2,000 CUP for all the avocados in the orchard,” says Tomas Garcia, a resident of Calabazar south of the capital. Retired from the Ministry of Construction, the man supplements his monthly pension of less than 20 Cuban convertible pesos (roughly $20 US) with the sale of the tasty fruits from his patio. “One day my mother-in-law threw a seed in the trash in a corner, and then we realized that bush had sprouted.” Garcia replanted the small plant in a better place and, without knowing it, he made “the best investment in my life,” he acknowledges now. Although he has never considered exporting his small crop, the pensioner believes that “if something is good in this country, it is avocados that need little care and can be planted in any yard.” He says that in addition to eating them from time to time he uses them to “give a shine to my hair” and his wife uses it as an anti-wrinkle mask. “If I don’t have much to eat, I only have to cut an avocado in half and now I have a rich person’s meal instead of a poor person’s,” he said.